Personalize your corporate look with embroidered uniforms or workwear. Get all the insights on how to succeed from our uniform specialists. In 1999, The New York Times wrote an article titled ´Using Needle and Thread to Tell a Story´. While The New York Times discussed the use of embroidery in art, the title could headline a uniform design conference. They highlight your identity, look and ethos, and personalize your corporate communication. You can go a long way with needle and thread if used correctly. Our uniform specialists will tell you exactly how to do that. Let´s begin with the basics. Designing new corporate apparel includes making choices, e.g. deciding on displaying key features as an embroidery or print. Clients often come to us with the following questions. Which option do we choose? Which is cheaper? Cost is important, but the price should never be the determining factor. The look and feel you want your uniform wearers to portray should play a significant role as wearers represent your brand on client touchpoints. Shirts, pilot caps and jackets boast a touch of exclusivity when featuring embroideries, compared to prints. Embroidered corporate clothing from Icelandair and Air Iceland do this this beautifully. However, prints also have their part to play. We use printed logos on our tech outerwear collections to keep performance intact and ensure shell fabrics remain undamaged. To ensure employees are easily recognizable to customers, we added a reflective feature to the print. Key takeaway: print performs well on shell fabrics, while embroideries add an aura of exclusivity on crew shirts, jackets and pilot caps. 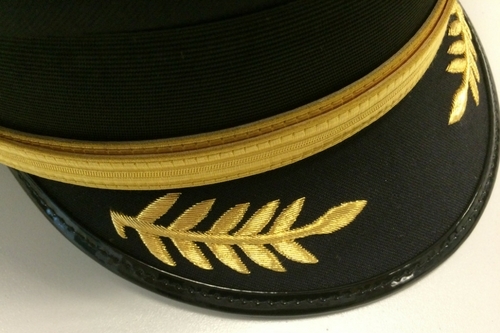 Unless you want your embroidery to cover your entire uniform, a key takeaway is to keep complex details to a minimum. You can make anything into an embroidery. However, our experience tells us that the best results come from a clean design with sharp edges. A great way to make your embroidered corporate apparel easily decodable is to think of the color combinations you use. Using matching colors looks great, but makes it harder to decode your logo. Mixing contrasting colors will make it stand out – and easily recognizable to customers. Colors, details and size are customizable to create any look. You do not lack options. Instead, the task is to simplify the design by opting for a few, carefully chosen details that will personalize your uniforms and corporate wear. That way, the embroidery will complement the overall design and tell your individual story. and share our expertise on uniform solutions with you.